It is not a straightforward task to produce a definitive list of those who died in Preston in the nineteenth century. The burial records of the parishes of Hitchin, Kings Walden, St Pauls Walden and Ippollitts must be consulted as well as the records of the non-conformist churches and chapels in Hitchin. A further complication is that after 1855, Hitchin burials were conducted at St Johns Road Cemetery and not at St Marys churchyard, Hitchin. I am very grateful to Carole Casey, Burials Officer for North Hertfordshire District Council for providing a list of burials of Preston people from 1855 to 1901. Another problem is that although census returns indicate that some villagers died at Preston in the decade between the censuses, I have been unable to find a record of some of these burials. 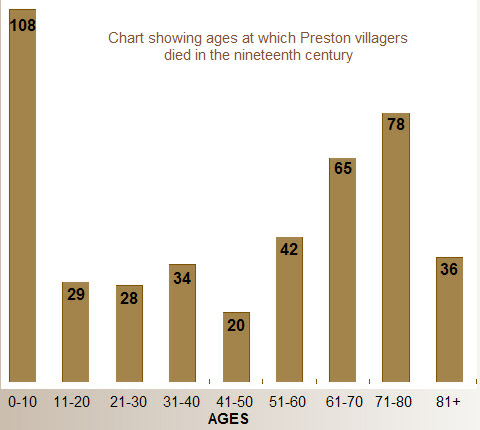 From 1800-1900, I calculate that about 459 Preston residents died - an average of 4-5 each year or approximately 1% of the village’s population. The oldest man in Preston during this century was my 3x great grandfather William Ward, a farm labourer, who died in 1866 aged 94. The oldest woman was Mary Andrews of Poynders End who was 93 when she died in 1839. The pattern of longevity in Preston is as one would expect. Twenty percent of babies died before reaching twenty-four months. Forty-one percent of villagers lived to the age of 60 and beyond. So, if Prestonians survived to the age of two, then a probable life span of at least 60 years lay ahead - provided mothers survived childbirth and farm workers avoided lethal accidents. Sources: Parish Records of Hitchin, Ippollitts, St Pauls Walden, Kings Walden; Hertfordshire Burial Index; North Hertfordshire Council Burial Records.